This post was written as a preface for the book my uncle, Moshe Teitelbaum, published for the family. I hope to soon post some of the articles, I think my readers will enjoy them. The Teitelbaums are a remarkable family. Hagoan Harov R’Yaakov Teitelbaum z”l was a pre-war talmid chacham who did not let America change him. To the contrary, he changed his corner of America. His Rebbetzin a”h was his mirror image. To them, their mesorah was inviolable. Unchanging. Unyielding. I had the privilege of spending only six weeks in the proximity of “Reb Yankele” during his long tenure as Manhig Ruchani of Camp Agudah, in its spiritual home in Highmount, New York. He had a profound influence on the staff members and campers who were wise enough to become close to him. It was 1953, and the yeshiva world was a far cry from what it is today. Black hats were very rare and beards and payos were virtually non-existent. A case or two of cholov yisroel was delivered once or twice a week, and often there was not enough for the few people who wanted it. Reb Yankele was a major factor in the lives of many of us, and without questions he left his stamp on Camp Agudah, and through it on all the Torah camps in America. Few people today remember what an important influence he was. He was a very strong person, whose Yiras Shamayim was uncompromising and whose hashkafos were undiluted. He spoke at every Shalosh Seudos, in addition to his shiurim for the staff. I remember one passionate Shalosh Seudos deroshoh, because it illustrated his sense of responsibility, his emunas chachamim, and his fearlessness, all rolled into one. He spoke about his visit to Harav Aharon Kotler zt”l in Lederer’s Hotel in Fleishmans, not far from Camp Agudah. The Lederer family had a small hotel whose kashrus was so impeccable that all of the gedolim, from the Kapitchnitzer Rebbe to Reb Aharon felt comfortable there. That was one of the periods when a major issue in Eretz Yisroel was whether the government should permit pig farms to open and supply pork to the country. The economic situation was dire, the government was very secular, and the religious parties had far less influence than they have today. Reb Aharon was a tireless fighter against the campaign to permit pork in the Holy Land. Reb Aharon was being resoundingly attacked by the secularists for getting involved in “political issues.” As a rosh yeshiva, he belongs in the bais medrash, and politics was none of his business, his no-religious foes insisted. Rav Teitelbaum at the Shalosh Seudos, spoke about his visit with Reb Aharon, and quoted him. He said, “If fighting against chazir is politics, then I am a politician!” That was a lesson to us young staff members and the campers who were mature enough to grasp the message. We have an achrayos, a responsibility to Klal Yisroel and to Hakodosh Boruch Hu. If battles have to be fought for Kovod Shamoayim, Jews have to enlist. Both Reb Aharon and Reb Yankele, and every one like them, had no interest in “politics.” But, allegiance to Torah transcended politics, such struggles were at the very root of our existence. No one who knew Rav Teitelbaum and the Rebbetzin could ever be complacent when Yiddishkeit was an issue. 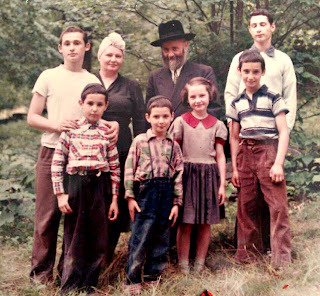 It is a great service, therefore that my old and much-admired friend Reb Moshe Teitelbaum has prepared this memoir for his children and grandchildren. It would be a tremendous service if more of us took the time and trouble to write such biographies. His off-spring should be grateful that he has done so. More importantly, they should be grateful to have him as a role model. I have known him and Rabbi Eli Teitelbaum z”l since 1953. Reb Moshe and I spent years together in Bais Medrash Elyon and at the Yarchei Kallah in Lakewood. His hasmodah and drive were always awesome. As this book shows, he absorbed the spirit and hashkofoh of his parents. Few people are capable of writing this kind of memoir. Anyone who reads it will be inspired and elevated. Reb Moshe has written the story of his parents and his own, as well. Their hashkofoh and his are in this memoir. There are powerful pieces here, such as an analysis of Agudath Israel and Daas Torah, in a lengthy letter to his father-in-law. And there are many biographical chapters about his struggles to make a parnassah as a Shomer Shabbos as well as his travels and development as a person, husband, and father. One who reads this book will come away with a sense of mission, a picture of father and son who defied odds and opposition without surrendering to ‘reality’ – and won! It was written as a legacy for his family, but it is also a legacy to Klal Yisroel. Reb Moshe – thank you!